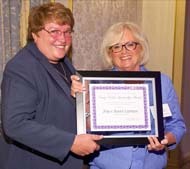 On the evening of June 24, 2015, the New Jersey Chapter of the WFFC held their 3rd Annual Recognition Awards Dinner at The Grove in Cedar Grove, New Jersey. The Recognition Award nominations are based on criteria focused on individuals who are considered exemplary figures and mentors in the fragrance & flavor industry and deserve to be recognized due to their professional accomplishments in their field. After carefully considering the nominees submitted by the WFFC members, the organization chose to honor one Perfumer and one Flavorist to receive the 2015 Recognition Awards. 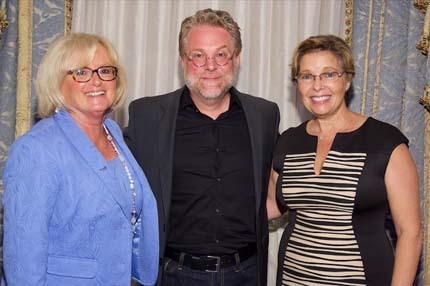 Odila Zocca, Technical Vice President & Chief Perfumer, Premier Specialties, Inc. and Tony Moore, Chief Flavorist, Flavor Producers were this year's award recipients. Both have shown tremendous fortitude, leadership, and perseverance during their careers, and the awards were well deserved. 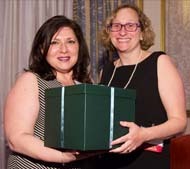 This year, the WFFC New Jersey Chapter created a new award: “The Nancy Poulos Leadership Award.” This award was established in honor of Nancy Poulos Drevitson, a long standing WFFC member, past President, and board member who passed away earlier this year. 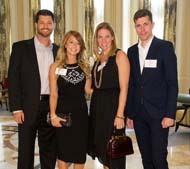 Nancy embodied what it means to be a leader, making substantial contributions and going above and beyond for an organization and industry, which was always close to her heart. 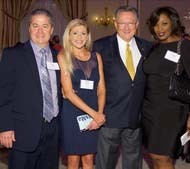 The WFFC was honored to have Nancy Poulos’ family and friends as guests at the event. Fittingly, the 2015 Nancy Poulos Leadership Award honored Joyce Raad Lipman, the first WFFC President and one of its founding members. The award recipients were each introduced by a colleague with whom they have worked throughout their career and then received their certificates and awards presented by Amy Marks-McGee, WFFC President. The new venue was well received by the more than 125 industry attendees and proved to have excellent food and service as dinner was served after the awards ceremony. The evening was a night of networking and celebration and the WFFC is thankful to all attendees for their continued support. In addition, the WFFC would like to thank the following event sponsors who helped make this event possible through their generous partnerships: Berje, Inc., Panzarasa Group, Pearlchem Corp., Takasago International Corporation and Teawolf LLC.